This newly renovated two-bedroom apartment in Barcelona can be found very close to Las Ramblas and many more of the city´s must-see attractions. Decorated with style, it keeps many of its original characteristics, such as the wooden ceiling beams and exposed brick walls. With a capacity of up to six people, it has one bedroom with two single beds (which can be made into a double bed) and a wardrobe, and one bedroom with a bunk bed (two single beds). The dining-living room is bright with large windows that lead onto two balconies overlooking the street, and it includes a sofa bed and a large dining table. There is also Wi-Fi so you can keep in touch with friends and family at home as well as a TV - perfect for relaxing after a long day of sightseeing. The American style kitchen is very modern and fully equipped with all you would need to prepare your home-cooked meals. There is also a washing machine and iron for your convenience. 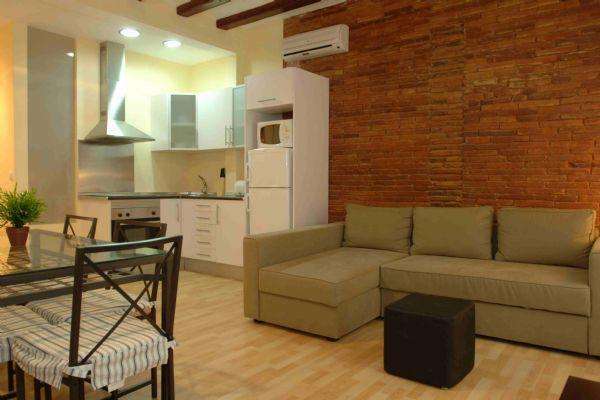 This fantastic apartment in Barcelona also has heating and air-conditioning, which, along with its brilliant location, provides you with a great choice of accommodation, no matter the time of year. Please note that this apartment is for families and clients over 30 years old.